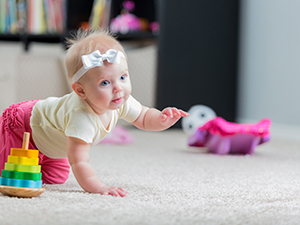 Cleaning carpets and properly disinfecting floors contributes to a healthier “air-space” for your children and pets, who live life with a different, intensely more polluted air space than you do. Because of gravity, children and pets breathe air far more polluted than what we breathe. Their world, at their height, or sitting, laying or crawling on the floor is saturated with chemicals, germs, and dust particulate that settles in and finds home. In addition to organic pollutants, viruses and bacteria, things such as chemical fertilizers, insecticides, lubricants, oils, man-made carcinogenic ingredients, and harmful cleaners run rampant clogging and inhibiting healthy living. These are things you rely upon on daily life, or even live with as you are surrounded by the materials that built your home. Your children and pets, more so than you, cannot escape the exposure due to gravity. It can stand to reason, that air samples at 5-6 plus feet are far healthier than life on the floor, or at 1- 4 plus feet. Steaming & cleaning restores the carpet, or floor surface for that matter. Just like emptying or changing a heater’s air filter, cleaning carpet removes particles in your home’s biggest filter, your carpet. Clean carpets regularly, vacuum and clean tile and hard surface floors so you can feel better about the “air space” or world your children and pets live in. Making the right decisions about carpet starts with having the facts.That is why the Carpet and Rug Institute (CRI) sponsors scientific research and gathers data from independent sources to help professionals and the public make educated flooring choices. Visit carpet-rug-org to learn more. 1 Shishoo, R. and Borjesson, A. 1996 Allergy claims “unproved”. Carpet and Flooring Review (January 5). 2 Zock, J.P., D. Jarvis, C. Luczynska, J. Sunyer., and P Burney. 2002. Housing Characteristics reports mold exposure and asthma in European Community Respiratory Health Survey, Journal Allergy and Clinical Immunology 110 no. 2:285-292. 3 Cicciarelli, Bradley A., David L. Davidson, Edward H. Hart and P. Robert Peoples. CFD Analysis of the Behavior of Airborne Allergens in Carpeted and Uncarpeted Dwellings. Solutia, Inc.